In case you missed the recent paper on maize organ primordia in the journal Nature Genetics, here's why this is a pretty big deal. The two corn varieties on the left combine to form a high-yielding hybrid in the center. On the right, two hybrids grown with weak alleles of the FEA3 gene. 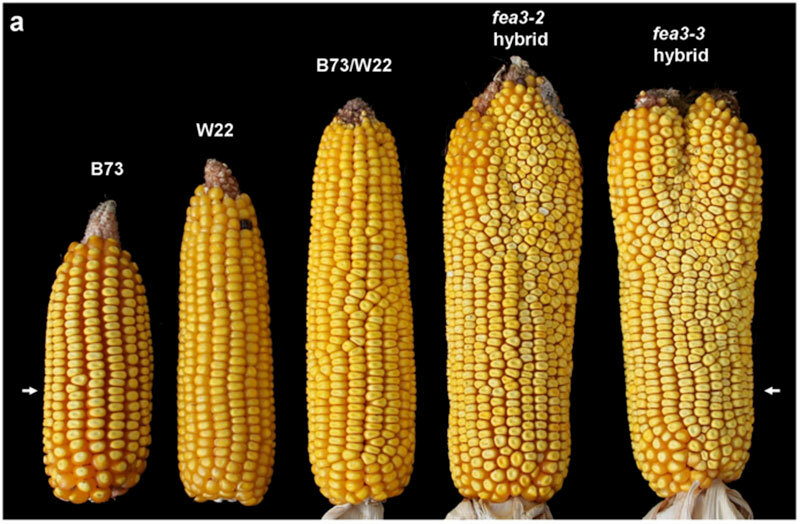 The team of scientists that recently identified the FEA3 gene showed that these weak FEA3 alleles yielded nearly 50 percent more corn than control varieties. For the roughly 7.4 billion people on earth who aren’t geneticists but do eat food, the relevance of this research lies in the fact that Jackson and his colleagues used their new discovery to breed corn plants with bigger ears and more kernels that showed yield increases of nearly 50 percent compared to control plants. “It is extremely exciting that this may have a real-world application,” Jackson tells Modern Farmer in a phone interview. Just a little bit more science here: The strange Russian corn that led Jackson et al. to this discovery had deformed ears and a paltry yield. Its FEA3 gene wasn’t working at all, due to a natural mutation, and as a result, the plant grew way too many stem cells for its own good. In the lab, however, Jackson and his colleagues were able to develop corn plants with “weak alleles” of the FEA3 gene. In these plants, the FEA3 control system regulates stem cell production with a lighter touch, resulting in a stem cell boost that means bigger ears and bigger yields without the ill effects – like disorderly, less-efficient kernel arrangement on the cob – caused by stem cells gone amok. Jackson calls the research the most exciting he’s been a part of in well over 20 years. This doesn’t mean that corn farmers will be boosting yields by 50 percent next season using this weak FEA3 corn, however. For one, the control plants used in CSHL’s test fields aren’t the same varieties used for commercial production. Secondly, the process of moving scientific discovery from the laboratory to the cornfield is a long and rigorous one. That task is underway, however. DuPont Pioneer – a huge Iowa-based seed company and one of several funders of the just-published FEA3 research – has begun converting “weak FEA3 alleles into potentially commercially-relevant hybrids and [arranging] detailed yield testing,” writes Dr. Bob Meeley, senior research manager, in an email. Meeley – one of Jackson’s 13 co-authors on the paper – declined to predict how long it could take before weak FEA3 corn varieties hit the market. He explained that the process of developing a commercial variety involves backcrossing weak FEA3 corn into multiple different lines, followed by at least two consecutive years of detailed testing in different locations. Meeley added that the company has “no expectations for as dramatic an increase” as was observed in the academic research, but expressed optimism about its potential. “Given the uniqueness of [Jackson’s discovery], I share his excitement that we can do more research to test many hypotheses about reproductive potential and yield,” Meeley adds. Finally, Jackson and his colleagues also showed that the FEA3 is present and performs the same function in Arabidopsis, a small, fast-growing plant he described as the “fruit fly of plant genetics.” This suggests that selectively breeding weak alleles of FEA3 could allow farmers to realize yield increases in all staple food crops, not just corn. And that could, theoretically, allow them to feed more people from the same amount of land under cultivation. For Jackson, potentially helping increase the global food supply is a rewarding side benefit of his work but isn’t necessarily what gets him out of bed in the morning. “My primary motivation is to figure out how these genes work,” he says.